The M18 REDLITHIUM HIGH OUTPUT XC6.0 Battery Pack provides 50% more power and runs 50% cooler vs M18 REDLITHIUM XC battery packs. The optimized combination of size and increased power provides a great solution for the entire range of M18 products. It delivers fade free power and runs substantially cooler through heavy applications, allowing tradesmen to push their cordless tools harder and longer than ever before. The M18 REDLITHIUM HIGH OUTPUT XC6.0 provides increased power in extreme cold weather conditions (below 0F / -18C) and delivers more work per charge, driving corded replacement on the jobsite. 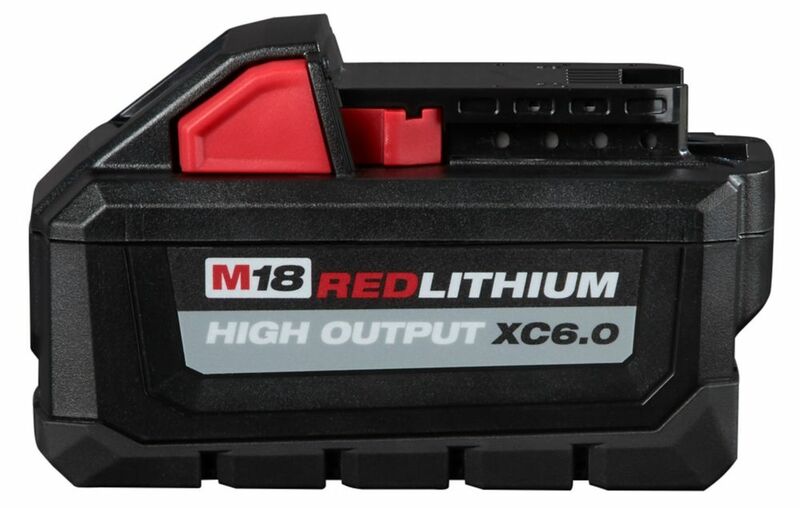 The REDLITHIUM HIGH OUTPUT XC6.0 battery is fully compatible with 150+ M18 solutions. M18 18-Volt Lithium-Ion High Output Battery Pack 6.0Ah The M18 REDLITHIUM HIGH OUTPUT XC6.0 Battery Pack provides 50% more power and runs 50% cooler vs M18 REDLITHIUM XC battery packs. The optimized combination of size and increased power provides a great solution for the entire range of M18 products. It delivers fade free power and runs substantially cooler through heavy applications, allowing tradesmen to push their cordless tools harder and longer than ever before. The M18 REDLITHIUM HIGH OUTPUT XC6.0 provides increased power in extreme cold weather conditions (below 0F / -18C) and delivers more work per charge, driving corded replacement on the jobsite. The REDLITHIUM HIGH OUTPUT XC6.0 battery is fully compatible with 150+ M18 solutions. M18 18-Volt Lithium-Ion High Output Battery Pack 6.0Ah is rated 4.9 out of 5 by 12.